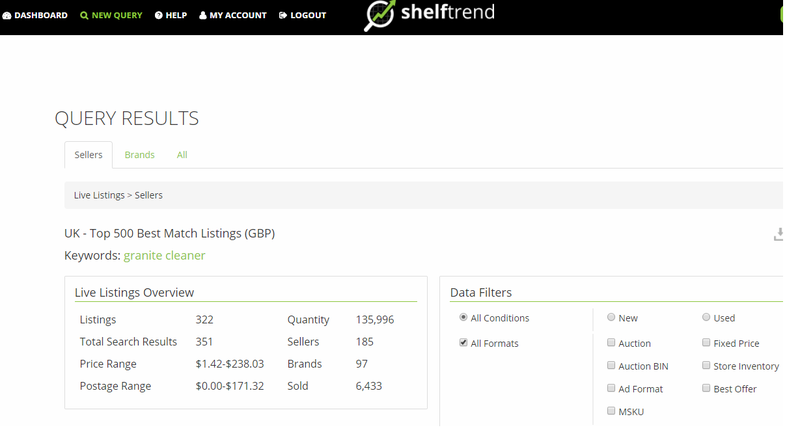 ShelfTrend is a great tool for eBay product research and many have migrated to this tool from Terapeak purely because it gives insight on competitor’s top-selling products. So, what are the common uses of Shelf trend? 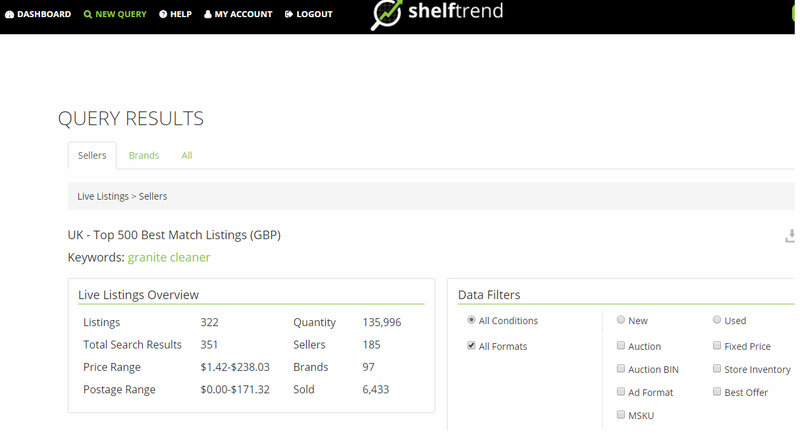 Search with a query and you will be presented with a result like below where you can see the average price of a product, number listings, postage and so on. It is also good to know how many sellers (competitors) are selling similar products. #2 Filters are a great way to narrow down your search. For example, you might want to exclude all private sellers using “Store listings” which is Good til cancelled listings. 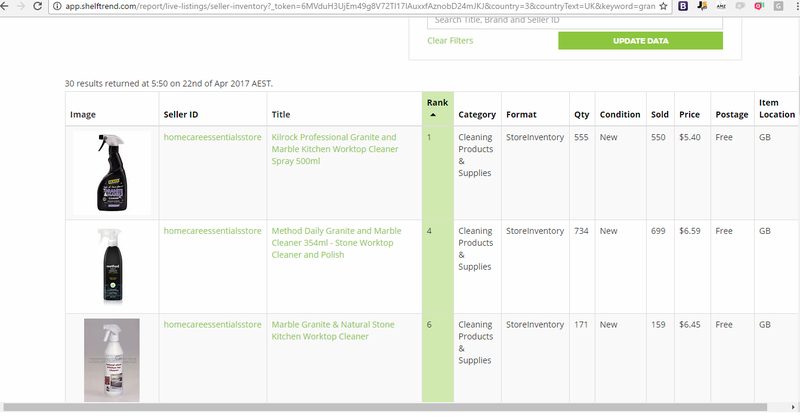 #3 Competitors are shown in a Seller Summary report as seen in the screenshot below. Based on your search query you can see fast stats like how many they have sold and the median (middle) price of all their listings that rank for your query. #4 Once you click on your competitor’s ID you will be presented with a detailed view of the product they are selling based on your search query. This is generally a good way to find out if your competitor is selling bundles and how they are doing with it. Also, it gives you a better understanding of your competitor’s product depth and sales figures. #5 Brands are shown in a Brand Summary report (Premium users) as seen in the screenshot below. Based on your search query you can see fast stats like how many they have sold and the median (middle) price of all their listings that rank for your query. #5 New Listings report After researching on the Live Listings report it is important to also look at new products that enter your category. This ensures you spot any threats from competitors who might list same or similar products at better prices or postage. Most drops in best match rank are a result of new products trending upwards that were discovered too late. Always watch your shelf! These are really good insights for someone who is researching or for growing eBay sales. All of the above are free function apart from filters & Brand Summary report. If you are ready to pay for this service there is also an additional download to csv file function. The download function is good especially if you are following your competitor and would like to monitor changes in their product titles or prices. What’s new coming to ShelfTrend? From the middle of this month, there will be a new design and additional features releasing for the free & paid versions. They aim to help you make better sourcing decision and learn more about your product rank.